I watched "Tinker, Tailor, Soldier, Spy" last Saturday and the fantastic movie – what an amazing cast! – goes right into my list of reasons why Gary Oldman is one of the greatest actors out there – possibly the best I have seen acting so far (Robert De Niro lost that spot a long time ago). The movie is not everyone’s cup of tea, though – I saw some people leaving the theater long before the movie ended. Well, their loss. I’d loved the movie already and this video made me admire it even more. Preheat the oven to 180°C/350°F. Lightly butter a 25cm (10in) springform pan*. Dough: whisk the flour and salt together. Using a stand mixer with the paddle attachment, beat the butter and sugar together on medium speed for about 3 minutes, until creamy and light in color. Beat in the vanilla. Reduce the speed to low, add the dry ingredients and stop mixing when the ingredients are fully incorporated but the dough is still crumbly – this happens quickly; don’t overmix, otherwise you’ll end up with a ball of dough. Set aside 1 cup of the dough and refrigerate. Sprinkle the remaining dough onto the prepared pan, distributing it evenly. Bring the dough slightly up the sides of the pan, then press it onto the pan to hold it in place. Prick the dough all over with a fork, then bake for 25 minutes or until toasty brown. Remove the pan from the oven. Distribute the raspberries over the crust and sprinkle with the sugar – I forgot to do that and only remembered after sprinkling the dough over the berries; then I sprinkled the sugar over the dough. Sprinkle the remaining 1 cup of dough over the filling. Bake for 35-40 minutes or until the berries collapse and begin to release their juices and the topping is slightly brown. Cool the tart over a wire rack before removing it from the pan. 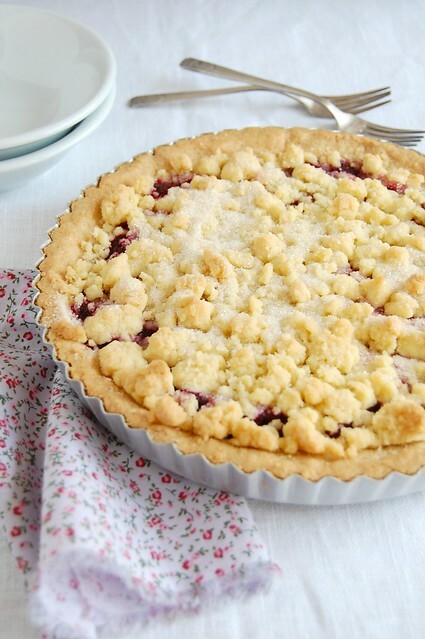 You had me at "raspberry crumble" - I can't wait to make this! I've seen exactly both those comments: people seem to either love the movie or hate it. It's on my list - hope I can make it through it when the time comes! Love raspberries. So delicate yet so tasty!